A contact comparator in which movement is amplified usually by a rack, pinion, and pointer or by a parallelogram arrangement. (microcator), a measuring instrument whose mechanism is in the form of a tape spring twisted in the middle part, which rotates through a definite angle upon tension (Figure 1). It is used for linear measurements by the relative contact method. They were first made in the 1930’s by the Johanson Company of Sweden. The length being measured, which is shown on a scale by a pointer attached to the middle part of the spring, is proportional to the angle of rotation of the spring. To make measurements, the instrument is mounted on a pedestal. It is usually adjusted to the required size by an end standard, which is placed between the tip of the instrument and the plane of the pedestal’s table. 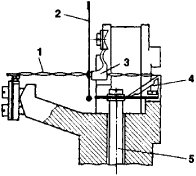 The mechanism of a mechanical comparator is used in small spring measuring heads, or micators; spring-lever indicators, or minicators (see Table 1); and spring-optical measuring heads, or opticators. Vzaimozameniaemost’ i tekhnicheskie izmereniia v mashinostroenii. Moscow, 1972.